So I actually got some DIY projects done this past weekend while Mike was away at drill. I'm really excited with how they turned out. 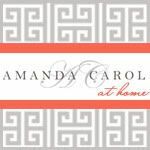 I was also motivated by the summer Pinterest Challenge that Censational Girl, Young House Love, Bower Power and Ten June threw out there last week. I found this reupholstered ottoman on Pinterest that really inspired me to redo mine. 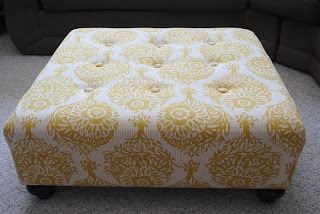 Ok, so here's what my 7 year old ottoman looked like. The legs were all nicked and chipped! Here's what it looked like reupholstered. Like brand new! Finally, I went outside and spray painted all 4 legs, they looked amazing after 2 minutes. I love spray paint! And a little Instagram action! SO beautiful!! And no sewing- perfect for me!! Now on my list to thrift shop for is one of these! Thank you! Beautiful makeover! I love the fabric and the nail-head trim. Thank you so much! Such an easy project that made a huge impact.